Being a boat owner has many pro’s and con’s. The biggest pro is being out on the water and enjoying everything that the open sea has to offer. However, the biggest con is the maintenance aspect, and keeping it in prime condition can take lots of time and effort – that’s where Marine Bodyworkz Ltd can help. Being on the water can mean that your boat quickly starts to look less than pristine, a long way from the shiny hull you once admired. The good news is that it’s easy to get your boat gleaming once more with a thorough clean and valet. Marine Bodyworkz Ltd offers cleaning valet services which can restore your boat to it’s former glory. Regular maintenance is highly recommended in order to keep your vessel in the very best possible condition and can cut down on your future repair bills too. "Boat maintenance can be a real inconvenience, but is essential if you want your boat to stay in the very best condition. Taking the time to look after your boat will protect it from damage and reduce the number of repairs that may be needed in the future"
Our boat cleaning services will leave your boat gleaming like new, with a thorough scrub down and wash from top to bottom. Any marks on the exterior will be carefully removed with a ‘soapy wash down’ using industry leading products to get the best results. Once your boat is clean, we’ll rinse it thoroughly and then go over every inch of the surface with a chamois leather, drying down all windows and stainless steel parts. This immaculate attention to detail will leave your boat looking its very best and ready to take to the water once more. 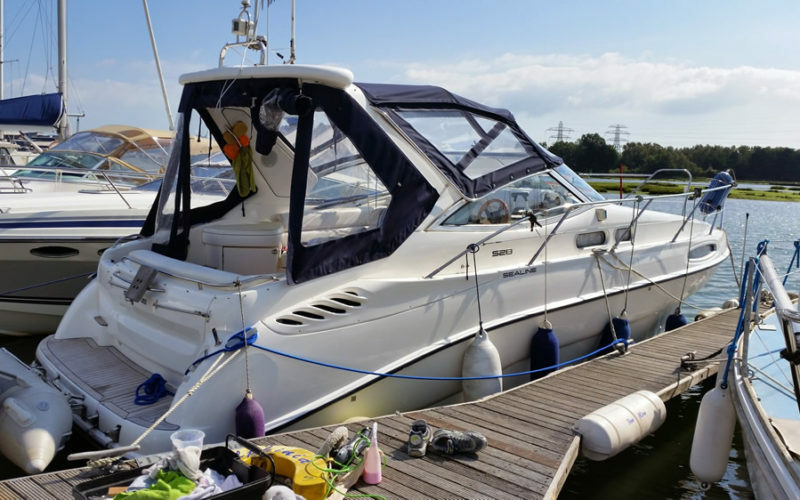 Able to work at any location that’s convenient for you, we specialise in high-quality machine polishing and gel coat restoration in GRP boats. Marine Bodyworkz Ltd can work on any size boat, so if you’ve got a speedboat or perhaps something larger, even a super yacht, we are the professionals who can help. Marine Bodyworkz Ltd guarantees that we’ll leave your hull polished and shiny, with your teak clean and bright. We’ll get rid of any grey and green patches, bird strike and ravages of the weather, leaving it restored to it’s original beauty. All we need to valet your boat is access to an electricity supply; this is to power our machine equipment. We are extremely experienced in restoring boat’s to their former glory and original appearance , with immaculate attention to detail that simply cannot be rivaled. We help our customers reduce the cost of their boat maintenance by offering a variety of cleaning programmes as part of a regular contract. This can be done as often or as little as you want with wash-downs every week if required, or perhaps spaced out with maintenance carried out monthly for example. Marine Bodyworkz Ltd have the skill and experience needed to look after your boat all year round and offer very competitive contracts which provide real peace of mind. The team at Marine Bodyworkz Ltd are based in Cornwall but we know that it may be expensive or impractical to get your boat to us. So never fear! You can still have the benefit of our superior boat cleaning and valet services with us simply coming to you instead. Contact us today to find out more about the special contracts we have available, and how they can be tailored to suit you.